Severe drought and risk of famine has placed the people of East Africa in dire need of necessary aid. You can save lives. The people of East Africa have been suffering after severe droughts, which heightened the already great risk of famine and left half of the entire country in desperate need of food. Sadly, the threat of famine persists, however with your help, we can help people recover, one family at a time. Deadly floods after severe droughts in east Africa displaced 332,000 people and have killed 183 people. 46.5% of Sudan is in poverty of which 3.5 million are food insecure. 45% of Somalis do not have access to safe water, and 37% do not have access to basic sanitation. In 2017, Somalia also faced a cholera outbreak and the threat of measles. The crises of 2017 only compounded an already struggling nation that has battled decades of political instability, armed violence and climate change. In fact, staggering 73% of Somalis live below the poverty line and over six million people are in need of humanitarian assistance due to the ongoing drought. We believe in empowering communities to lift themselves out of poverty, but we can’t do this without your support. Please donate today to reduce the suffering and improve the livelihoods in East Africa today. £100 - Our sustainable livelihood projects provide people with the skills, training and equipment needed to support their families. Distributed Ramadan food parcels to 1,000 refugees in Eastern Sudan, as part of our Feed the Fasting Programme. Each parcel ensured that a hungry family had eaten for a whole month. Distributed nutritious meals in Somalia, feeding 278 vulnerable and displaced households, affected by floods in Kahda and Daynile district, Mogadishu, every day for 10 days in Ramadan. Assisted a total of 53,745 people in Somalia in 2017. Rehabilitated agricultural lands, provided irrigation channels and pumps to strengthen a community of 1,800 against natural disasters. Rehabilitated sanitation infrastructure, provided hygiene kits and training, benefiting 17,400 people. In five camps for displaced people, we trained Ministry of Health and camp management staff in hygiene promotion, clean-up campaigns, sanitation in response to the Cholera outbreak. Provided 11,970 people with food during Ramadan. Distributed meat to 15,525 people during Qurbani. Mother-of-five Amina used to help her husband rear their livestock. But the severe drought brought on a struggle to survive, and then her husband was killed in a clan conflict. 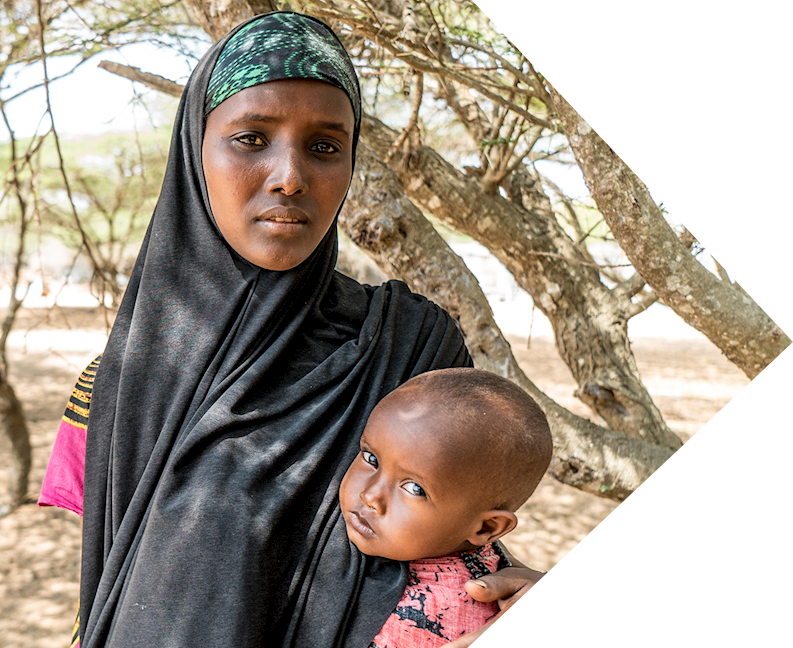 Amina began skipping meals to try to ensure her children had enough to eat, but the 35-year-old struggled since she was nursing her youngest child at the time. Amina and her children left behind their home to seek help. They stopped at an agricultural village but couldn’t find the support they needed and so they left for a camp in Mogadishu. But even in the capital, Amina struggled to find food and safe shelter for her children. Neither Amina nor her children has been vaccinated and they don’t have access to medical care. Her older children haven’t been to school in over a year and Amina worries about them falling in with a dangerous militia, who often recruit young boys by promising a better life.